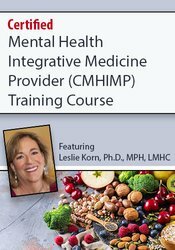 Leslie Korn, Ph.D., MPH, LMHC is a renowned integrative medicine clinician and educator specializing in the use of nutritional, herbal and culinary medicine for the treatment of trauma and emotional and chronic physical illness. She is known for her dynamism and humor as a speaker. 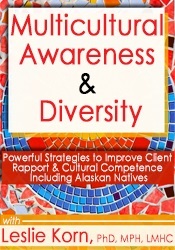 She has provided over 50,000 hours of treatment in private practice for diverse populations. Her clinical practice focuses on providing clients effective alternatives to psychotropics. She completed her graduate education in the departments of psychiatry and public health at Harvard Medical School and her life training in the jungle of Mexico where she lived and worked alongside local healers for over 25 years. She directed a naturopathic medicine and training clinic facilitating health, culinary and fitness retreats. She is licensed and certified in nutritional therapy, mental health counseling, and bodywork (Polarity and Cranial Sacral and medical massage therapies) and is an approved clinical supervisor. She introduced somatic therapies for complex trauma patients in out-patient psychiatry at Harvard Medical school in 1985 and served as a consultant in ethnomedicine to the Trauma Clinic, Boston. She is the former clinical director and faculty of New England School of Acupuncture and faculty at the National College of Naturopathic Medicine. She is the author of the seminal book on the body and complex trauma: Rhythms of Recovery: Trauma, Nature and the Body (Routledge, 2012), and Nutrition Essentials for Mental Health (W. W. Norton, 2016), Eat Right Feel Right: Over 80 Recipes and Tips to Improve Mood, Sleep, Attention & Focus (PESI, 2017), Multicultural Counseling Workbook: Exercises, Worksheets & Games to Build Rapport with Diverse Clients (PESI, 2015) and The Good Mood Kitchen (W. W. Norton, 2017). She was a founder of the National Certification Board for Therapeutic Massage and Bodywork, a Fulbright scholar in Herbal Medicine and an NIH-funded scientist, in mind/body medicine. She is an approved clinical supervisor, core faculty at Capella University, and is the research director at the Center for World Indigenous Studies where she designs culinary and herbal medicine programs with tribal communities engaged in developing integrative medicine programs. Non-financial: Leslie Korn has no relevant non-financial relationship to disclose.